What’s in a number? Quality, not quantity is what is needed in the Android market. Last week, there were a number of tech publications about the number of Android apps available in the Android market. Androlib estimated that there are nearly 100,000 apps, but Google announced last Thursday in their earnings call that the number is actually 70,000. Many people compare this to the number of apps in the iPhone store, which is more than 225,000. But how relevant is the total number of apps really? On AppBrain, users can upload all the apps they have installed to our servers, and subsequently manage their apps from their computers, or make the list public and share it with their friends. We calculated from 100,000 recently uploaded application lists that the average user has ‘just’ 65 apps installed on their phone. The question is, are all 70,000 apps roughly equally likely to be installed? The clear answer is no! The following graph shows apps in order of installs among our users. In the graph we added a few random sample apps to get an idea of what’s there. Further down are the official Twitter app, the official eBay app in the top 100, around place 300 our own popular Steamy Window app, and further down around place 1,000 the Gentle Alarm (a paid app) and around 5,000 a snow live wallpaper. Out of all the installed apps on phones of AppBrain users, the 5,500 most popular apps were each installed on more than 0.1% of the phones. In other words, the other 64,500 apps (92% of the total) have an install base of less than 0.1% of all phones. In our eyes, the problem of the Android market is clearly not that there’s too few apps. Rather, the problem is finding the apps you really want from the huge set that’s available. Popularity lists like the Android market provides don’t really solve the problem, as not all good apps are popular with a big audience. And there’s a lot of low quality apps among the less popular ones too. We took a first step towards solving this problem when we launched an algorithm that subtly hides apps that are very likely to be low quality, back in March. At that time, about 30% of the apps were hidden in this way. In the meantime, the problem seems to have become much bigger. 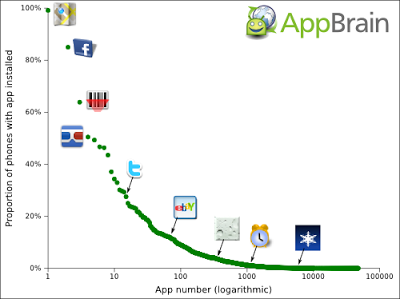 The following graph shows the number of apps in the AppBrain catalogue over time, along with the low quality app number. The algorithm still uses the same criteria, but now flags nearly 50% of apps. The decrease around July 10th is not an error. One Android developer, “For-side.com Co. Ltd” suddenly removed all its apps around that time (or maybe he was removed by Google?). This developer had more than 4,000 apps listed, which were clearly autogenerated, and were badly rated by Android users, and were already picked up as such by our algorithm. We are working hard on making it even easier to find the best apps in the Android haystack, and will soon launch a number of exciting app discovery features using analysis similar to the one in this blogpost. So stay tuned, have a good summer and happy app browsing!